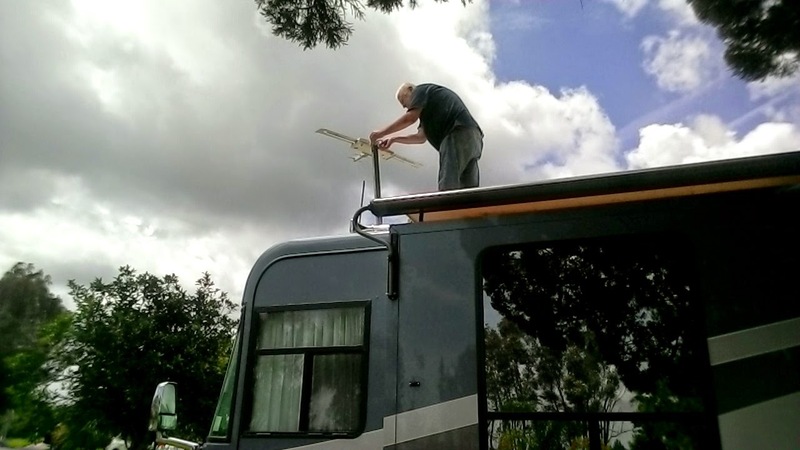 This morning Roger climbed up onto the roof to change the tv antenna. Once he climbed up he seemed confident so I relaxed and took photos. He said the view was incredible. 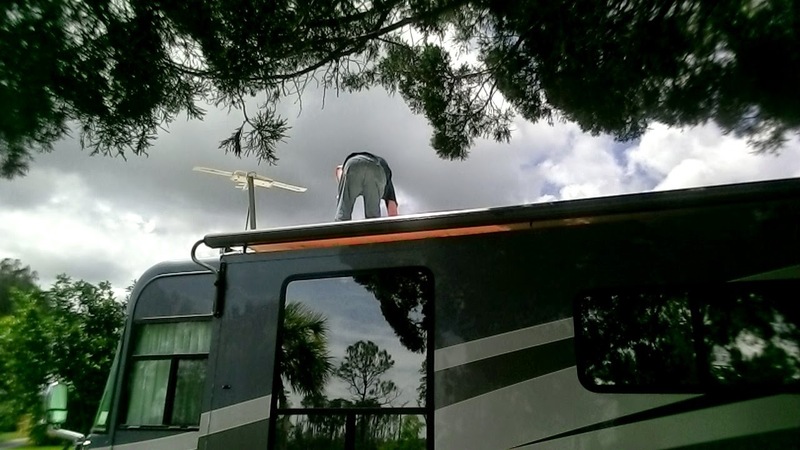 to pick up our Country Coach, the mechanic said he would seal the roof for us. Roger laughed and said, " well he did what he said, it's sealed everywhere!" My thought? As long as we have no leaks I'm not concerned about the roofs beauty. Right after, we had some breakfast then decided to go to Merritt Island Reserve and get our " over 65" Park passes. First I needed to clean out my Grand Cherokee. UGH. I have been lugging all my art stuff in the back and stuffed that all under the coach in the slide out trays. Then off we all went. Fun ride?? NO! Sammy wanted to sit in front, then Ozzie wanted to be the hood ornament. As we went along we both decided to get a gate for the car so the boys would be better behaved while we travel on adventures. I know Sammy just wanted to sniff new sniffs but egads, it really helps to see the road while driving. What about Lola?? For her size and age, a year, she is fantastic. She just lays down and looks out the window just happy to be included. Treats for Lola!!! An afternoon storm came up while we were on our way home sooner than we thought. The awning was out and when we got home it was filled with water. Between the heaviness of the water and the wind a side arm has been bent. 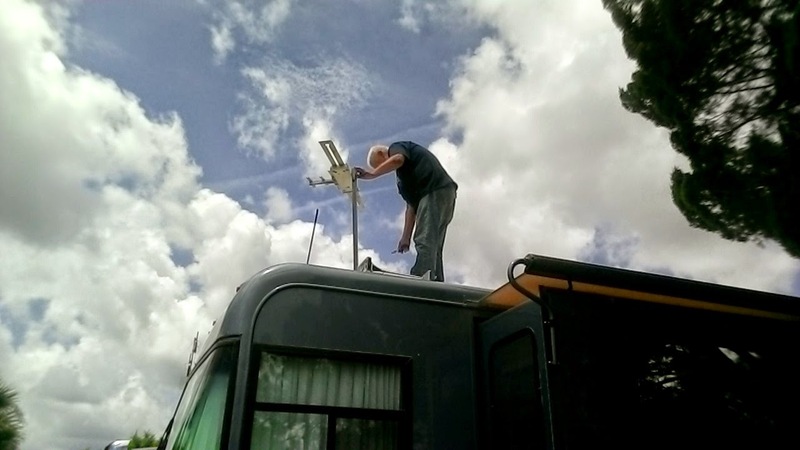 We do have one more day to call in any issues on our 30 days warranty but we weren't sure this would be covered until Roger remembered we have a wind sensor for the awning. It should have gone back up. Our outside rug had blown up and across a table so we knew the wind was strong. It's Florida. Afternoon storms are sometimes like a tropical storm or worse. I called Lazy Days and it's on the list of "To-do's" . Something really cool though was a beautiful white Egret just flew into the lake, caught a fish and walked up in front us chomping away. He swallowed it . Then gracefully walked away with the shape of the fish in his neck. Lola was thrilled, calling out to him as he walked. Pulling down the shades of the coach makes Egrets and everyone else disappear!!!! Love it! Ok..have a great night. It's stopped raining here for a bit so we may go and try repairs on the awning to see if we can get it to retract. The adventure begins!!! Those are great photos...especially the ones with the trees and sky reflected in the Windows. Still trying to find the perfect places for my supplies. Noticing I need to leave some behind though. Just the necessities.